These simple but striking earrings are collaged from coffee package stamps! If you love coffee AND greyhounds, these are designed with you in mind. 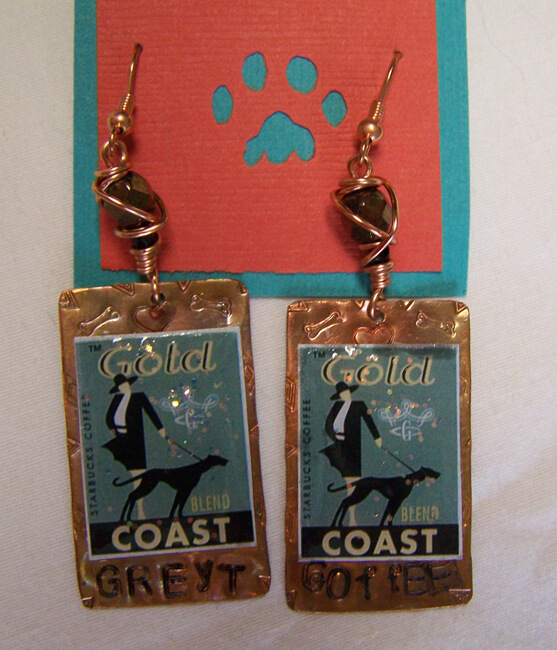 The pure copper base is stamped with hearts and tiny dog bones, and the words "greyt" and "coffee." The earrings measure approx. 3/4" x 1 1/4" (excluding wires), and are finished with coppery crystal beads and copper ear wires. The stamps are glossed with a coat of clear resin, and a subtle touch of "fairy dust" iridescent glitter.